Posted on February 25, 2012 by Peter Cairns6 Comments on Ten minutes of ecstasy!! Muslims make the pilgrimage to Mecca; Catholics visit St Peters in Rome; Hindus congregate along the Ganges; Jews wail at the Wailing Wall in Jerusalem; Mormons trek to Salt Lake City (apart from the one who hopes to become the next US President, he is too busy campaigning) and politicoes attend Party Conferences. Northshots’ aficionados return to Ballintean and Glenfeshie for their Cairngorms refresher, their spirits to be revived by the sight and smells of the Caledonian forests, the sprightly River Feshie, the confident golden eagle, the cantankerous capercaillie and the over- exposed red squirrel. One looks forward to the reassuring welcome from Amanda, the creaking floor above one’s bedroom, the rustic Cairns-carved toilet roll holders, the wet wellies in the stone lobby and, of course, the celebrated red squirrel. Will one be accosted by his agent as one scrambles up to ‘his hide’ and will he demand an even bigger royalty this year as the prima donna squirrel wearies of all this media attention? These are the questions. As the countdown to our next trip ticks by, the anxieties multiply. Should one upgrade from the trusty 500mm lens to the ‘big bazooka’, the 600mm? After all, no less than the Prime Minister has stated that we need such a device to solve many of Europe’s woes. Maybe a 600mm lens would improve one’s wildlife reach, but will it focus close enough from the Northshots’ hides on a ‘Crestie’? Cairns always says that ‘equipment is not important’, but of course, it is – just ask those frustrated amateurs with their diminutive silver digithingy trying to capture a stork nesting upon a lofty church tower. Has one prepared a suitable slide show for the after-dinner sessions? Will it all be an anti-climax? No, Pete will make sure of that as there is always the latest 2020VISION escapade to report. So much has happened on the photographic front during the past year and snow and ice seem to feature heavily. Yes, there will be plenty to talk about during those after- dinner sessions. articulate Niall Benvie and Charlotte Eatough. I did not believe Cairns knew such nice people! Our Senja group hit the jackpot on this trip with not only surprising shots of the northern lights on the first night but, on the second night at around 11-30pm, ten minutes of such electrifying green light that we seemed to be on another planet! Yes, we had nailed it, including the famous ‘dancing curtains’. 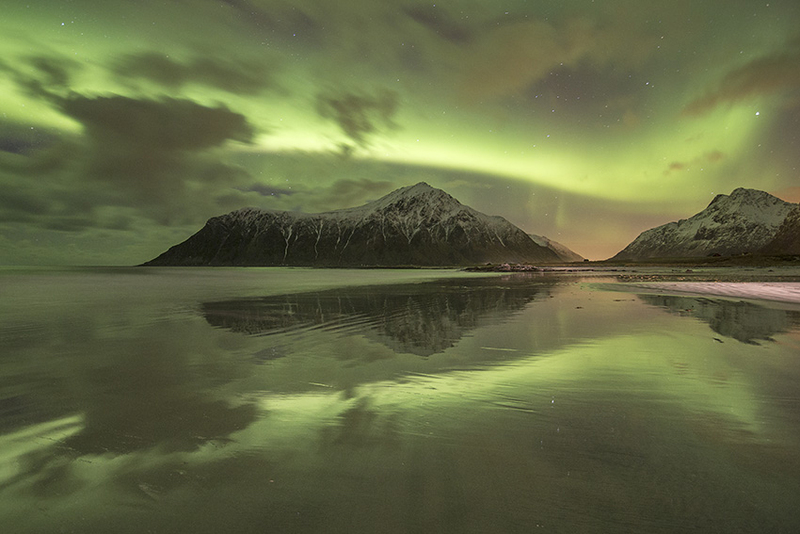 At one point, the light burst above the mountain skyline as though a green volcano was erupting! Solar activity is at a high level this year and we had been blessed. The ecstatic cries from our group echoed around the snowy valley and the icy mountains. Niall and Charlotte caught one another eyes and shared a knowing smile. Mission accomplished! Afterwards, bags to pack, aircraft to board, stories to share, images to edit, captions to write, slideshows to prepare, Photoshop to curse, even blogs to create. It is hard work, this photography business! Text & images: John Cumberland.